The cannabis industry is booming. Since the legalization of Marijuana in Colorado in 2012, other states have followed suit and, as a result, the market valuation has grown exponentially. As reported in Forbes, “the worldwide legal marijuana trade grew by 37% in 2017”… and by 2022, the legal cannabis revenue in the United States is expected to reach $23.4 Billion. And at the epicenter of it all, LeafLink has become the largest marketplace for wholesale cannabis, serving over 800 brands and 2500 retailers across 14 states. Co-founded by Ryan G. Smith and Zach Silverman, LeafLink is a B2B ecommerce platform for dispensary purchasing managers to order inventory for their stores. Ryan has been a longstanding Next Gen community supporter, and was a speaker and a mentor at Next Gen Summit 2017 and 2019. Currently, LeafLink is processing over $60 million per month through their platform, which is now the largest aggregation of wholesale data. 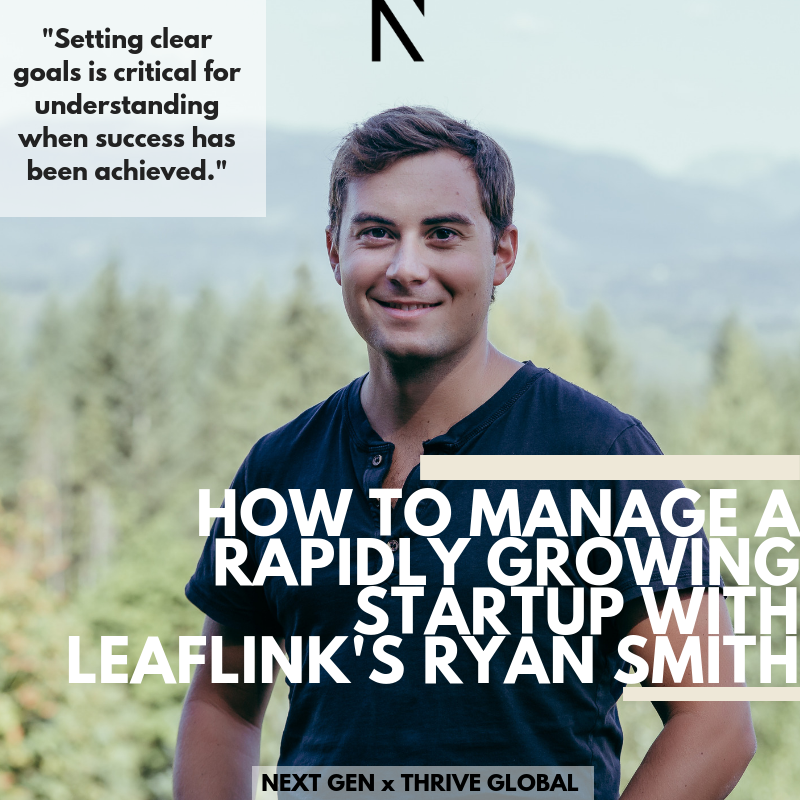 LeafLink is the first company in the cannabis industry to be named as a Top 10 Most Innovative Company by Fast Company, and Ryan was named to the Forbes 30 Under 30 List last year. I sat down with Ryan to talk about LeafLink’s past few years, and in particular, to understand how he and Zach have managed its exponential growth. As with any rapidly growing startup, management is key. I asked Ryan how he and Zach tag-team the management. “We work with our management team to set general goals for their teams and what they’d like to achieve,” he shared. When their team sets quantitative goals, the furthest out they set them is one year to 18 months out, and they set goals with very clear numbers. They lay a plan for what’s required to achieve them in accordance with their team goals. The goals of the company are important, too. They start with yearly goals, then roll them back into quarterly goals. Their key to achieving these goals is diligent management through one-on-one meetings. For example, Suzannah, the head of LeafLink’s marketing team, has daily one-on-ones with each of her team members. There are one-on-ones for every initiative. “Since we have a geographically distributed team, we overcompensate on communication,” he shared. These meetings closely track progress and hold the team accountable to those yearly goals, made possible by the day to day. LeafLink’s seed round was a $3 million raise in early 2017, which was quickly followed by a Series A round of $10M not even a year later, in November of 2017. I was interested in how LeafLink needed to change after the seed round to achieve the Series A. Setting clear goals is critical for understanding when success has been achieved and in their case, they had to work quickly to keep up with the rapidly moving cannabis industry. LeafLink’s overarching goal is to be the cannabis industry’s standard wholesale marketplace as the solution that helps their clients be smarter and better at their business. One way they’re doing this by releasing annual white papers which present the pricing patterns in different categories across the industry. These presentations of the wholesale pricing landscape will provide the industry with a baseline of how to price products more intelligently. These white papers will continue to keep the cannabis industry moving forward… with LeafLink at the forefront. We’re rooting for the LeafLink team, inspired by their vision and the management techniques they have in place to help them achieve it. To learn more about LeafLink, visit here. To meet more founders like Ryan, join the Next Gen Community here.